The GOES-13 satellite keeps a continuous eye over the eastern U.S., the Caribbean Sea, Gulf of Mexico and Atlantic Ocean, and noticed last night with "infrared vision" that a new tropical depression formed around 11 p.m. EDT. By the morning of Oct. 29, Tropical Storm Shary was making waves in the eastern Atlantic Ocean and a tropical storm warning is now in effect for Bermuda. The National Hurricane Center noted that storm conditions are expected on Bermuda during the afternoon of Oct. 29. Shary is expected to produce total rain accumulations of 1 to 3 inches over Bermuda. At 11 a.m. EDT on Oct. 20, Tropical Storm Shary had maximum sustained winds near 40 mph and some strengthening is possible. Tropical-storm-force winds extend outward up to 105 miles mainly to the north of the center. 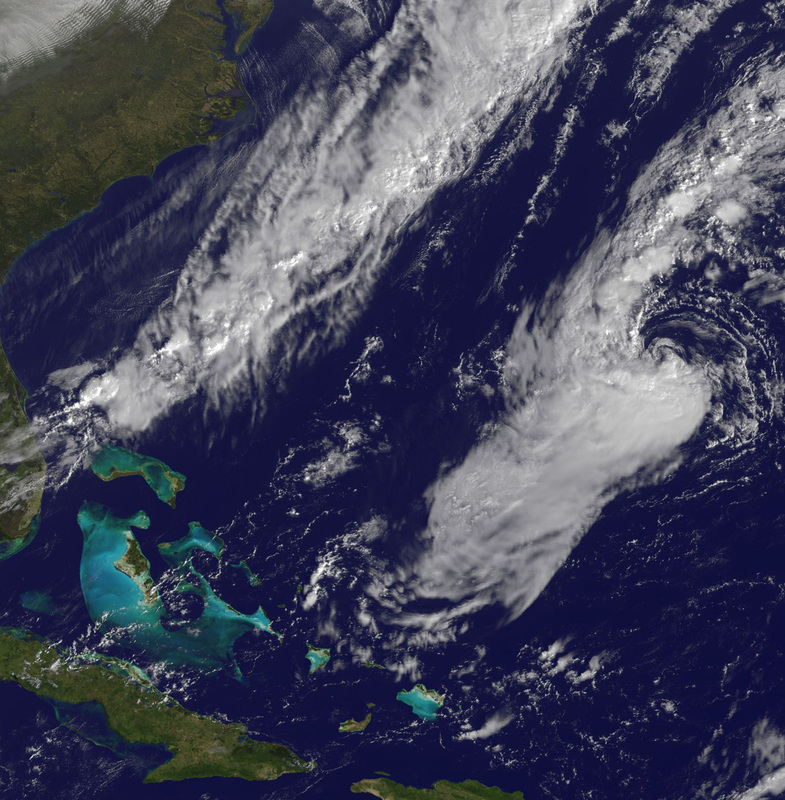 It was about 205 miles south-southwest of Bermuda near 29.6 North and 66.2 West. It was moving northwest near 9 mph, and is expected to turn north then northeast over the weekend. Shary had a minimum central pressure of1004 millibars. The Geostationary Operational Environmental Satellite called GOES-13 captured a visible image of Tropical Storm Shary on Oct. 29 at 1331 UTC ( 9:31 a.m. EDT ). GOES satellites are managed by NOAA. NASA's GOES Project at NASA's Goddard Space Flight Center in Greenbelt, Md. creates images and animations from the satellite data and created today's image that shows Shary appears like a comma shape in the eastern Atlantic, to the right of a line of clouds associated with a stationary front. Vertical wind shear has shifted in direction from the east to the north, so most of the convection can now be found south of the center of Shary's circulation. Dry air in the northern and eastern sides of the storm have also decreased convection and precipitation today. On the forecast track the center of Shary is expected to pass near or to the east of Bermuda tonight and early Saturday morning. Mission Managers Meeting About Repair Work, Update at 10 a.m.
Kennedy Space Center technicians have worked overnight to repair quick-disconnect fittings in the system used to pressurize space shuttle Discovery’s right Orbital Maneuvering System rocket engine. NASA managers will meet at 8 a.m. EDT to evaluate the replacement work on the connectors and determine Discovery’s next launch opportunity. Currently, launch is targeted for 4:17 p.m. on Tuesday, Nov. 2. NASA Test Director Jeff Spaulding will provide the latest details at 10 a.m. during a Precountdown Status Briefing on NASA Television. NASA Test Director Jeff Spaulding said this morning the launch team is confident that repairs to quick-disconnect fittings in the system used to pressurize space shuttle Discovery’s right Orbital Maneuvering System rocket engine will allow the shuttle to launch Wednesday, Nov. 3. The targeted launch time is 3:52 p.m.
"Right now we're in a good path to get there," Spaulding said. The shuttle has until Sunday, Nov. 7, to launch in the current window, Spaulding said. Discovery is going to the International Space Station on mission STS-133. It will attach the Permanent Multipurpose Module, packed with supplies, equipment experiments and Robonaut 2, to the station. The crew of six astronauts will conduct two spacewalks during the 11-day mission. The weather forecast for a launch Wednesday calls for 70 percent chance of acceptable conditions, according to Shuttle Weather Officer Kathy Winters. The main concerns are low clouds and the possibility of rain within 20 miles of the Shuttle Landing Facility at NASA's Kennedy Space Center in Florida, the shuttle's launch and landing site. 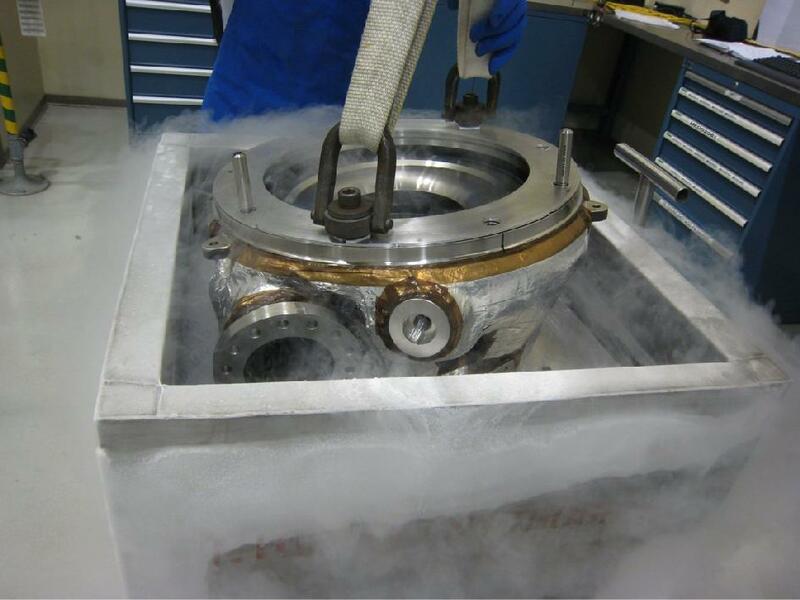 Manufacturing of NASA's J-2X rocket engine includes a Halloween plunge into an icy cauldron of liquid nitrogen. Key components of the J-2X fuel turbopump were assembled at Pratt & Whitney Rocketdyne’s facility in Canoga Park, Calif. The J-2X fule turbopump technology is the rotating machinery that drives the liquid propellants into the engine. The cold pump volute -- the structural housing that contains the high-pressure liquid hydrogen -- was mated with the pump’s turbine bearing support, which was heated in an oven to approx. 300 degrees. When the fuel pump is operating on the J-2X engine, the pump side is extremely cold due to the liquid hydrogen, and the turbine side is extremely hot because of the hot gas generator gases that drive the turbine. The parts are heated to temperature extremes to ensure a precise and secure seal during manufacturing. NASA's J-2X is an efficient and versatile rocket engine, offering the ideal thrust and performance characteristics to power the upper stage of a heavy-lift launch vehicle. Hardware for the first engine is being assembled at Pratt & Whitney Rocketdyne and at numerous subcontractor locations across the country, with testing anticipated at NASA's Stennis Space Center in early 2011. WASHINGTON -- The International Space Station partner agencies will mark a major milestone on Nov. 2 with the 10-year anniversary of people living permanently aboard the space station. NASA will commemorate the event with a news conference featuring the six crew members currently in orbit. NASA Administrator Charles Bolden will begin the event, speaking live to the station crew at 9:30 a.m. EDT from the Kennedy Space Center in Florida. His remarks and the following news conference will be broadcast live on NASA Television. The news conference will begin immediately after the administrator's conversation with the crew and be open to participation from accredited media representatives at participating NASA or international partner locations. U.S. media planning to attend should contact their respective NASA newsroom by 4 p.m. Monday, Nov. 1. Expedition 25, the 25th crew to live and work aboard the station, consists of Commander Doug Wheelock; his fellow NASA astronauts Scott Kelly and Shannon Walker; and Russian cosmonauts Fyodor Yurchikhin, Alexander Kaleri and Oleg Skripochka. The crew is awaiting the launch of space shuttle Discovery's six astronauts on the STS-133 mission to deliver supplies, spare parts and a permanent cargo module to the station. STS-133 is scheduled to lift off at 4:40 p.m. EDT on Nov. 1 from Kennedy. "As we look forward to the next 10 years, taking us through 2020, the space station will serve many roles," said Mike Suffredini, International Space Station program manager. "With its permanent human presence, it will serve as a foothold for long-term exploration into space, being an integral part of testing human endurance, equipment reliability and processes essential for space exploration." Since the Expedition 1 crew arrived at the station, humans have continuously occupied the orbiting laboratory. More than 196 people have visited the complex, and by the exact time of the anniversary ( 5:21 a.m. , Nov. 2, 2000), the station will have completed 57,361 orbits of the Earth, traveling some 1.5 billion miles. Representatives of the five international agencies that built and operate the station have agreed in principle to continuing its use for another decade. The governments of the 15 participating nations in the station partnership are in the process of formally endorsing that plan. More than 600 different research and technology development experiments have been conducted on the station, many of which are producing advances in medicine, recycling systems and a fundamental understanding of the universe. In addition to the crew news conference, NASA is updating the content of the International Space Station section of its website in recognition of the 10th anniversary. The update supports the on-going transition from station assembly to utilization. The website now will focus on the research in the unique microgravity environment of low-Earth orbit. The updated section of the NASA website incorporates an improved organization system to help visitors find what they are looking for with regard to research and technology development, crews and expeditions, international cooperation and the new capabilities of the station as a U.S. national laboratory. The new space station section also provides better linkages with social media applications, including a new International Space Station Program scientist blog, and Twitter accounts for astronauts aboard the station and the National Laboratory. For more information, visit http://www.nasa.gov/station. 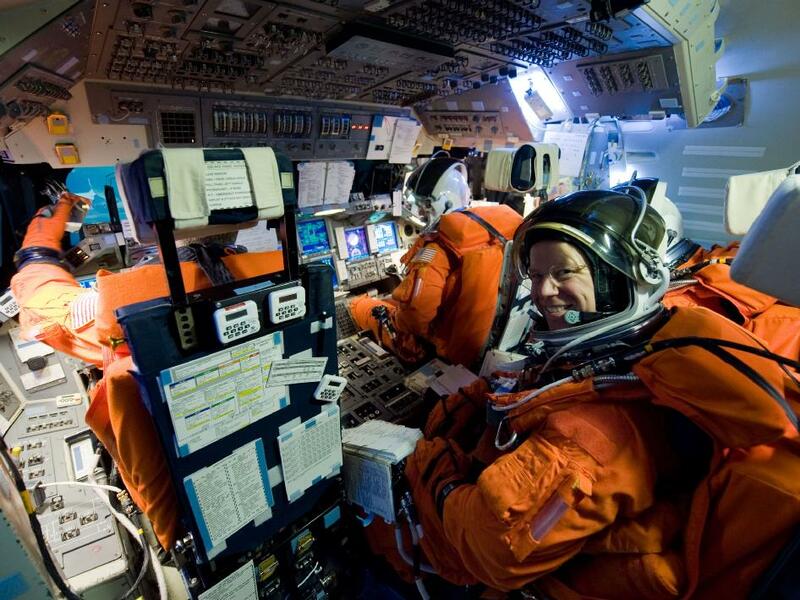 For a Flash feature and Web story on the first 10 years of human life aboard the station, visit http://www.nasa.gov/externalflash/expedition_10_years or http://www.nasa.gov/mission_pages/station/living/10years.html. Julie Robinson, space station program scientist, is sponsoring an inside look at how research is conducted on the station through a new blog. The blog will bring to the public the stories of the researchers and their discoveries as they unfold. For the new program scientist blog, visit http://go.usa.gov/atI. To follow station science on Twitter, visit http://www.twitter.com/@ISS_Research. To follow the station's national laboratory activities, visit http://www.twitter.com/@ISS_NatLab. To follow Twitter updates from Expedition 25 astronauts Wheelock and Kelly, visit http://www.twitter.com/@Astro_Wheels or http://www.twitter.com/@StationCDRKelly. The relatively insoluble minerals near the surface include what is thought to be hematite, silica and gypsum. Ferric sulfates, which are more soluble, appear to have been dissolved and carried down by water. None of these minerals is exposed at the surface, which is covered by wind-blown sand and dust. "With insufficient solar energy during the winter, Spirit goes into a deep-sleep hibernation mode where all rover systems are turned off, including the radio and survival heaters," said John Callas, project manager for Spirit and Opportunity at NASA's Jet Propulsion Laboratory, in Pasadena, Calif. "All available solar array energy goes into charging the batteries and keeping the mission clock running." The rover is expected to have experienced temperatures colder than it has ever before, and it may not survive. If Spirit does get back to work, the top priority is a multi-month study that can be done without driving the rover. The study would measure the rotation of Mars through the Doppler signature of the stationary rover's radio signal with enough precision to gain new information about the planet's core. The rover Opportunity has been making steady progress toward a large crater, Endeavour, which is now approximately 5 miles away. NASA's Jet Propulsion Laboratory manages the rovers for the agency's Science Mission Directorate in Washington. For more about the rovers, see http://www.nasa.gov/rovers. STS-133 Commander Steve Lindsey and his crew arrived at NASA's Kennedy Space Center in Florida this afternoon as the astronauts and launch team prepare to begin the countdown to Monday's launch of space shuttle Discovery. Lindsey, Pilot Eric Boe and Mission Specialists Michael Barratt, Tim Kopra and Nicole Stott touched down at the Shuttle Landing Facility at about 3 p.m. EDT aboard three T-38 jet aircraft. STS-133 Mission Specialist Alvin Drew, also flying in a T-38, had to turn around during the trip due to a an issue with the aircraft. He is expected to arrive around 4 p.m.
WASHINGTON -- President Barack Obama welcomed NASA Administrator Charles Bolden and a NASA team that assisted trapped Chilean miners to the Oval Office on Thursday for a ceremony that recognized Americans involved in the rescue. After the White House event, Bolden and Deputy Administrator Lori Garver presented NASA's Exceptional Achievement Medal to five agency employees who supported the rescue effort. The NASA Exceptional Achievement Medal is awarded for a significant, specific accomplishment or substantial improvement in operations, efficiency, service, financial savings, science, or technology that contributes to NASA's mission. "We're greatly honored by the president's recognition of these extraordinary NASA employees who assisted the Chilean miners," Bolden said. "I'm sure they would be the first to tell you they were just doing their jobs and nothing out of the ordinary, but the men and women of NASA do extraordinary things each and every day." - Clint Cragg, principal engineer for the NASA Engineering and Safety Center at the Langley Research Center in Hampton, Va. The employees from Johnson and Langley traveled to Chile Aug. 30 - Sept. 5 and visited the mine after discussions between the Chilean government and Condes. The team consulted with a number of organizations in Chile, including the Ministry of Health, Ministry of Mining, the Chilean Navy and the Chilean Space Agency. NASA provided technical advice to the Chilean government based on the agency's long experience in protecting humans in the hostile environment of space. NASA's initial support included recommendations on medical care, nutrition and psychological support. The request for later NASA support was broadened to include recommendations on the design of a Chilean vehicle used to extract the miners. Consultations continued between members of the NASA team and Chilean government officials until the miners were rescued. For information about NASA's support to the Chilean miner rescue effort, visit http://www.nasa.gov/news/chile_assistance.html. Discovery Targeted to Launch Tuesday at 4:17 p.m. The launch of space shuttle Discovery is targeted for Tuesday, Nov. 2, at 4:17 p.m. EDT . Managers are meeting to discuss the plan to repair helium and nitrogen leaks in the pressurization portion of space shuttle Discovery’s right-hand Orbital Maneuvering System (OMS) pod. The leaks must be fixed before launch and the decision was made to delay picking up the launch countdown by at least a day. NASA Test Director Jeff Spaulding will provide details at a 10 a.m. Precountdown Status Briefing on NASA Television. Attired in training versions of their shuttle launch and entry suits, STS-133 commander Steve Lindsey, pilot Eric Boe (background), and mission specialists Tim Kopra (right foreground) and Alvin Drew participate in a simulation exercise in the motion-base shuttle mission simulator in the Jake Garn Simulation and Training Facility at NASA's Johnson Space Center. WASHINGTON -- Two NASA spacecraft have been assigned a new mission after successfully completing their original science objectives earlier this year. The duo began making observations this week to study how solar wind electrifies, alters and erodes the moon's surface. Data could reveal valuable information for future explorers and give planetary scientists a hint of what's happening on other worlds around the solar system. For more information about ARTEMIS, visit http://www.nasa.gov/mission_pages/artemis. For more information about the THEMIS mission, visit http://www.nasa.gov/themis. Astronaut Steve Lindsey and his crew will fly to NASA's Kennedy Space Center this afternoon as the preparations for Monday's launch reach the home stretch. Flying from their training base at NASA's Johnson Space Center in Houston, the crew will land on the three-mile-long runway at Kennedy's Shuttle Landing Facility. In medical quarantine to prevent getting sick right before the mission, the astronauts will spend the next several days going over mission details, enjoying some free time and keeping their skills sharp. For instance, Commander Lindsey and Pilot Eric Boe will make several simulated shuttle landings in the shuttle training aircraft, or STA. The countdown for Monday's launch of space shuttle Discovery begins tomorrow at 3 p.m. EDT . Technicians will spend the weekend putting the finishing touches on Discovery. Liftoff is scheduled for 4:40 p.m. EDT , the precise time that the shuttle's launch pad will be in the same plane as the International Space Station it will chase and dock with during the flight. NASA's Wide-field Infrared Survey Explorer, or WISE, captured this colorful image of the reflection nebula IRAS 12116-6001. 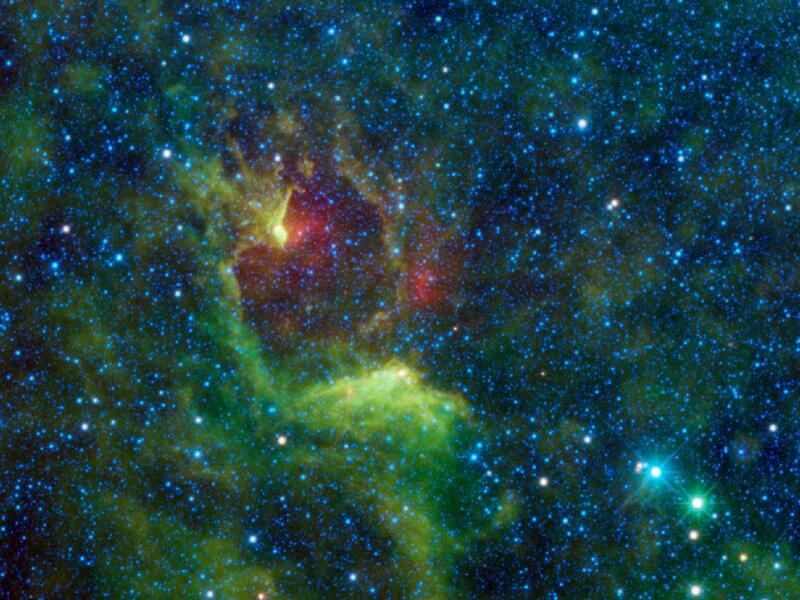 This cloud of interstellar dust cannot be seen directly in visible light, but WISE's detectors observed the nebula at infrared wavelengths. 13 October 2010, McMurdo Station, Antarctica: Where’s the romance? I think you are a romantic. Now this is a very romantic age, so there is no room for romantics; it calls for practical men. A hundred years ago you would have made a banker or a professor and you could have worked out your romanticism by reading fanciful tales and dreaming about what you might have been if you hadn’t the misfortune to be born into a humdrum period. But this happens to be a period when adventure and romance are part of daily existence. Naturally it takes very practical people to cope with it. Antarctica is romantic, in the classical sense of adventure and exploration. The same way there’s a romance about flying and about the sea and about space travel. It’s romantic, that is, unless you’re actually here. If you’re here, you work. I suppose the point of this dispatch is to permit me to apologize for not aptly conveying the romance from Antarctica that I often feel about Antarctica. Through these Dispatches I’ve attempted to describe the feeling of romance for the place that I feel when I am not here. There’s an element of artificiality about it that can’t be avoided. Like my compatriots, I’m here to work; to accomplish a mission. Most days, I wear intellectual and emotional blinders [some call compartmentalization] that permit me to focus on the task at hand. To get the job done. Allowing myself the luxury of enjoying the moment, of feeling the romance, of smelling the polar roses as it were, would necessarily undermine my progress. So I work. We all work. The default schedule is 12 hours a day, 6 days a week. Daylight permits it and the mission requires it. Yet, each day there are moments. Moments when I catch a glimpse of a slanted fog bank full of ice crystals that make a circular rainbow [icebow?] around the sun. Moments at the top of a ridgeline when I can see glaciers and volcanoes and mountains out to near infinity. Moments when the stark beauty of this place literally takes away my breath. These are the moments I draw upon for inspiration when it comes time to write about being here. They are few. And I wish I could share them all with my wife and daughter. I’ve learned that the longer I am away from Antarctica, the more romance it takes on in my mind. However, the longer I am here, the more pragmatism overcomes my being. That’s not to say that coming here is a disappointment or a let down. Not at all. The work is rewarding. Yet, coming here is transformational. This place changes people. Such cycles of perception and change may have eventually settled down in the early heroic explorers, who describe the same place in very different terms. Every day some new fact comes to light – some new obstacle which threatens the gravest obstruction. I suppose this is the reason which makes the game so well worth playing. To one degree or another, I believe we all have the capacity for romance and pragmatism. Most of us carry on somewhere in the middle, rising to the occasion as needed to get through a tough challenge. People working in Antarctica seem on the surface to be more practically inclined. If you believe Heinlein, and I do, romantic times and places require practical people. Taken one step further, one might argue that places like Antarctica, all at once majestic and beautiful, yet also cruel and unforgiving, force even the most romantic among us to find that inner practicality. …More likely though, the pragmatic souls gathered here in the name of science seek just a few moments of peace, allowing the romance of this strange land to carry them away. To that end, please enjoy the accompanying photos graciously provided by USAP participant Nate Peerbolt, and the rich Antarctic poetry offered by the former deputy commander, JTF-SFA, Col Ron Smith. I hope it carries you away. MOFFETT FIELD, Calif. -- News media are invited to attend a discussion lead by world famous biologist J. Craig Venter, best known for his role in sequencing the human genome and creating the first cell “booted up” from a synthetic genome. Biology on Earth readily demonstrates that life is an efficient user of resources surrounding it, turning those resources into habitats, materials and forms that perform various functions. If the promise of engineering biology on Earth is within reach, then it is time to ask scientists and engineers about possible applications of synthetic biology in space. Venter’s presentation will be part of NASA’s “Synthetic Biology” weekend workshop, which has a goal to understand if synthetic biology can provide a more efficient, lower cost, practical approach to specific challenges in space. NASA experts, experienced in the science and engineering of space missions, and experts from outside of NASA involved in basic and applied synthetic biology, will be present to discuss the role of synthetic biology in space. WHAT: Synthetic biology workshop features guest sspeaker J. Craig Venter, an expert in the field of synthetic biology. WHEN: 5 to 6:30 p.m. PDT Saturday, Oct. 30, 2010. WHERE: NASA Ames Research Center, Moffett Field, Calif., in the Ballroom of Building 3. 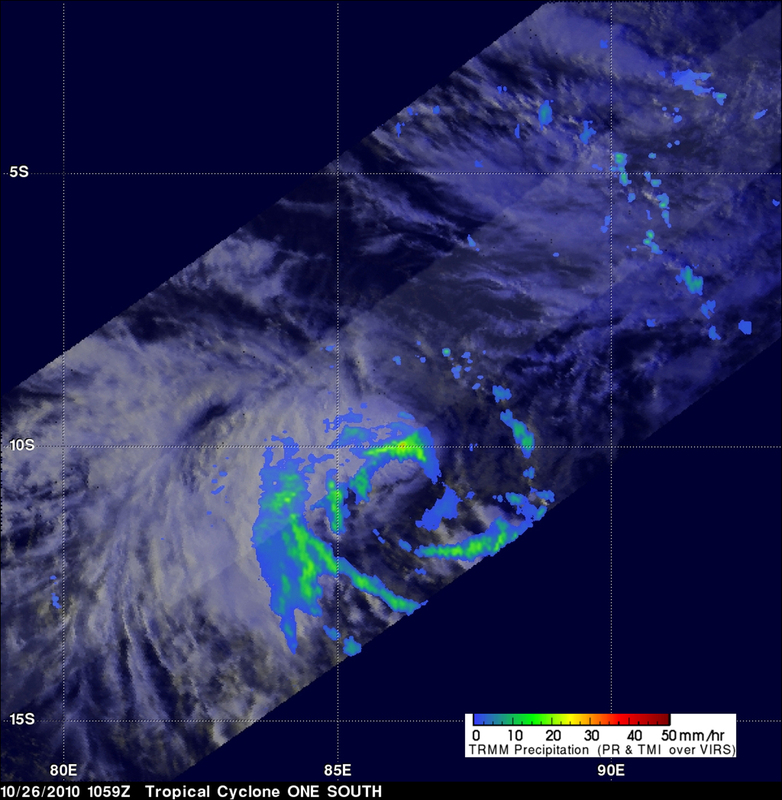 The TRMM satellite passed over Tropical Depression 1S in the southwestern Indian Ocean at 1050 UTC ( 6:50 a.m. EDT ) on Oct. 26 and measured light to moderate rainfall within the system. The yellow and green areas indicate moderate rainfall between .78 to 1.57 inches per hour. (Image Credit: NASA/SSAI, Hal Pierce) Tropical Storm 1S is maintaining tropical storm strength as it continues on its track in a south-southwesterly direction through the Southern Indian Ocean. On Oct. 27 at 0900 UTC ( 5 a.m. EDT ), Tropical Storm 1S had maximum sustained winds near 39 mph, the threshold for tropical storm strength. It was far away from land areas, some 825 nautical miles southeast of the island of Diego Garcia, near 12.5 South and 85.1 East. It was encountering a stronger vertical wind shear, so it has been unable to strengthen and is going to start running into cooler waters will which further reduce its chance to intensify. CAPE CANAVERAL, Fla. -- NASA and partners from the LAUNCH: Health forum will discuss innovative ideas during a media briefing on Saturday, Oct. 30, at 2 p.m. EDT . The local-only briefing will air live on NASA Television from the agency's Kennedy Space Center in Florida. LAUNCH: Health is part of an ongoing initiative to identify, showcase and support innovative approaches to sustainability challenges through a series of forums. It is the second forum in the series and will take place at Kennedy Oct. 29 and 30. During the forum, 10 international participants will showcase new innovations that could address health problems on Earth and in space. Ideas range from a biodegradable needle that dissolves in the body while releasing a vaccine, leaving no waste product; to a high-pixel cell phone-like device that could be used for remote ophthalmology. A list of the innovators and innovations is available online at http://www.launch.org. To participate as part of the LAUNCH: Health community, the public may access the live discussions and presentations online via MindMapper at http://mindmapr.nasa.gov. Reporters and interested viewers may watch portions of the forum live via UStream starting at 10 a.m. Oct. 30 at http://www.ustream.tv/channel/launch-health. WASHINGTON -- NASA has announced the successful activation of new hardware that will support water production services aboard the International Space Station. The Sabatier system can create up to 530 gallons of water per year from byproducts of the station's Oxygen Generation System and Carbon Dioxide Removal Assembly. The process is named for Paul Sabatier, a 1912 Nobel Prize winner in chemistry. "This is an important step forward in NASA's commercialization endeavors and shows how successful private industry can be at providing solutions on its own," said Bill Gerstenmaier, NASA associate administrator for Space Operations at the agency's Headquarters in Washington. "The ability to produce this water will be important for sustaining space station operations once the shuttle is retired." The system was integrated into the space station's Water Recovery System during the week of Oct. 11. Activation, checkout and first use of the system were completed Oct. 22, running for over eight hours. The Sabatier process uses a nickel catalyst to interact with hydrogen and carbon dioxide at elevated temperatures and pressures to produce water and methane. The water is retained for recycling processes, and the methane is vented outside of the space station. Prior to adding the Sabatier system, hydrogen produced while generating station oxygen was considered waste gas and vented overboard. Carbon dioxide generated by crew metabolism also was vented overboard. With the Sabatier system, these two former waste gases will generate a valuable product for the space station: water. Under contract to NASA, Hamilton Sundstrand supplied the flight hardware and operational support for a Sabatier-reaction-based system that operates as part of the station's Environmental Control and Life Support System. This contract is unique because NASA did not participate in design reviews or impose any specifications on the design, except for those defined in the safety, interface and acceptance requirements met by Hamilton Sundstrand. The company developed, procured, and built the flight hardware and support equipment needed for operations and training. The in-orbit operational portion of the contract runs until Sept. 30, 2014. Workers packed the special suits aboard Discovery at Launch Pad 39A at NASA's Kennedy Space Center in Florida as part of the continuing preparations for Monday's liftoff. The spacewalking suits are the familiar white versions that carry their own power and life support systems. In that sense, each spacesuit is basically a small spacecraft for an astronaut when he is outside the safety of the shuttle or the International Space Station. Mission specialists Alvin Drew and Tim Kopra will don the suits for two spacewalks on the outside of the station. Spacewalking suits are considerably stronger than the orange partial pressure suits the whole crew wears for launch and landing. Technicians are also continuing closeout work today on the Discovery's aft compartment and preparations are under way to pressurize the main propulsion systems. 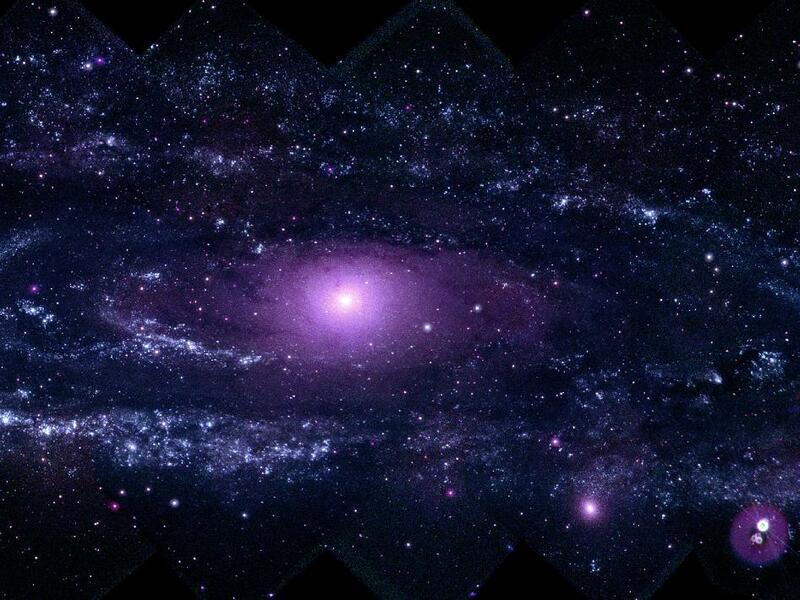 This mosaic of M31 merges 330 individual images taken by the Ultraviolet/Optical Telescope aboard NASA's Swift spacecraft. It is the highest-resolution image of the galaxy ever recorded in the ultraviolet. Also known as the Andromeda Galaxy, M31 is more than 220,000 light-years across and lies 2.5 million light-years away. On a clear, dark night, the galaxy is faintly visible as a misty patch to the naked eye. The irregular shape of the image results when the more than 300 images were assembled to make the final image. Two of the past three C-17 flights landed in rapidly changing weather. One of the flights landed in clear weather, but within a few minutes wind kicked up ice crystals and snow to create near white-out conditions near the surface. Needless to say, we suspended ground operations until the temporary phenomenon blew through. Prior to launching a C-17, Lt Col Robert “Beef” Wellington, commander of the 304th Expeditionary Airlift Squadron in Christchurch, checks the weather forecast several times. By 4:30AM each launch day, he’s made an initial go / no-go decision. Weather forecasters and observers at McMurdo Station, working for Space and Naval Warfare Systems Command, consult with their colleagues in New Zealand and back in the United States to build the most accurate forecast possible. But Antarctic weather is like no other. Lt Col Wellington and his operations officer continue to monitor weather conditions as his crews fly the 4-5 hour mission between Christchurch and McMurdo. The crews compute a point along the route, where they have equal fuel remaining to either continue to McMurdo, or turn back to Christchurch, still maintaining appropriate reserve fuel stores. They call this the point of safe return or PSR. Once the C-17 crew decide to fly past the PSR, they are committed to continuing on to land at McMurdo. There is no turning back. That makes accurate weather forecasting very important. In order to give the C-17 pilots flying these missions an opportunity to experience McMurdo weather firsthand, as well as meet the mission support people based here, Lt Col Wellington and I decided to try something new. Beginning this week, one C-17 instructor pilot will disembark with each C-17 mission and remain at McMurdo until the next C-17, 2-3 days later, can carry him/her back. The first pilot to visit us, Captain Chris Stephens, will arrive on tomorrow’s scheduled flight. Aside from his primary purpose of learning about the local weather and support infrastructure, I’ll ask Captain Stephens to offer a guest blog for these dispatches. Additionally, upon hearing that I had “lost” my camera, people at McMurdo and Christchurch have begun sending me photos and videos of Antarctica and the NSF’s science mission here. The attached b-reel footage is a montage of some of that footage. Special thanks to C-17 instructor pilot Captain Jon Waller for offering the cockpit views. 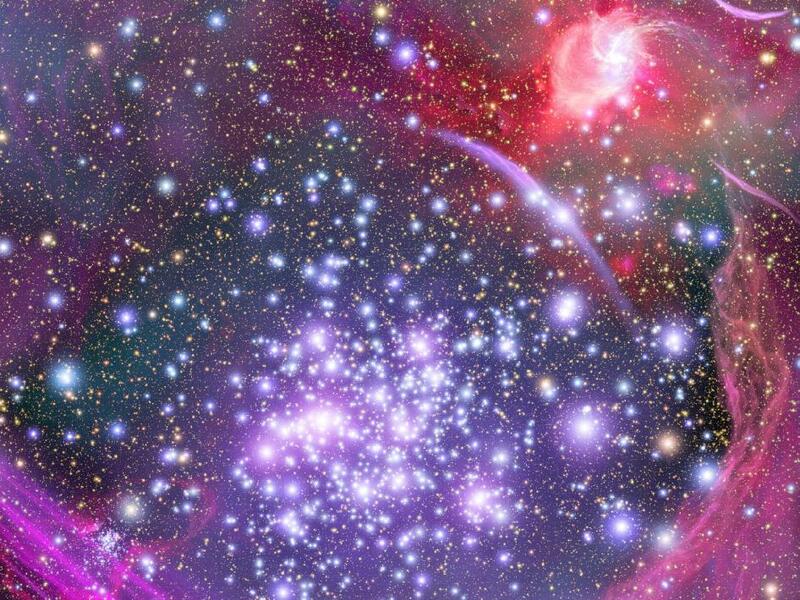 This artist's impression shows how the Arches star cluster appears from deep inside the hub of our Milky Way Galaxy. 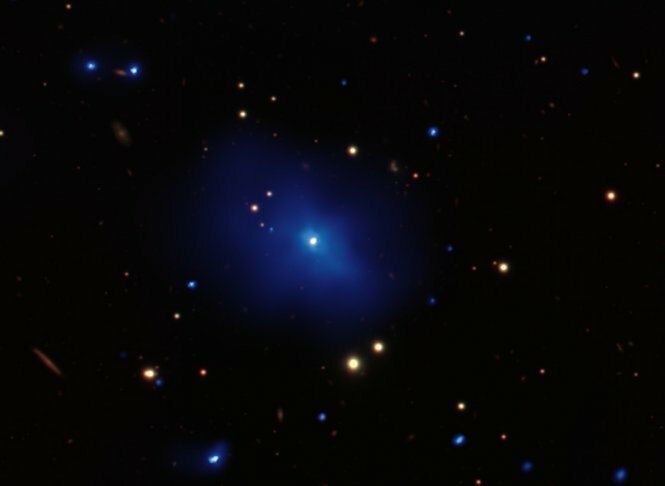 Hidden from our direct view, the massive cluster lies 25,000 light-years away and is the densest known gathering of young stars in our galaxy. The illustration is based on infrared observations from Hubble and with ground-based telescopes, which pierced our galaxy's dusty core and snapped images of the luminous cluster of about 2,000 stars. NASA's Aqua satellite flew over Typhoon Chaba early this morning and captured visible and infrared images of its clouds revealing a well-organized and strengthening typhoon. The Moderate Resolution Imaging Spectroradiometer (MODIS) instrument on Aqua captured a visible image of Typhoon Chaba on October 26 at 04:50 UTC ( 12:50 a.m. EDT ), as it moved through the Philippine Sea. To see the MODIS image, visit: http://rapidfire.sci.gsfc.nasa.gov/gallery/?2010299-1026/Chaba.A2010299.0450. Chaba is a large storm that stretches from the southern Philippines north to the Okinawa province of Japan. The Atmospheric Infrared Sounder (AIRS) instrument on NASA's Aqua satellite captured an infrared image of Typhoon Chaba's clouds three minutes before the MODIS instrument captured a visible image. The coldest, strongest, highest thunderstorm cloud tops were as cold or colder than -63 Fahrenheit. Comparisons of infrared image over the six hour period between 12:50 a.m. EDT and 6:50 a.m. EDT showed a sharp increase in colder cloud tops around the low-level circulation center of Chaba, indicating the storm is strengthening quickly. At 11 a.m. EDT on Oct. 26, Typhoon Chaba had maximum sustained winds near 75 knots (86 mph). It was about 430 nautical miles south-southeast of Kadena Air Base, Japan near 20.4 North and 128.1 East. It was moving northwestward near 5 knots (6 mph). The Joint Typhoon Warning Center forecasts Chaba to pass just to the east of Kadena Air Base late in the early morning hours of Oct. 29 local time, Kadena/Toyko Time (late in the evening of Oct. 28 EDT). Chaba is then forecast to track northeast and make landfall in Japan between Kyoto and Toyko at night local time on Oct. 30 (morning hours EDT). 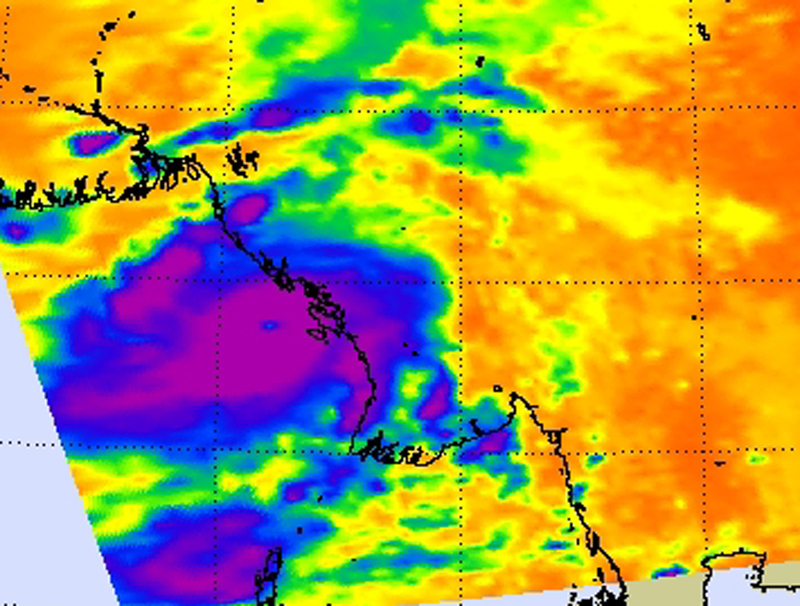 Cyclone Giri rapidly intensified last week before it slammed into the coast of Myanmar, and infrared satellite imagery from NASA's Aqua satellite conveyed its strength. Infrared imagery from NASA's Atmospheric Infrared Sounder (AIRS) indicated Giri's cloud tops had grown very cold, very quickly on Oct. 22 at 0653 UTC (2:53 a.m. EDT) indicating higher thunderstorm heights and a strengthening in the storm. High thunderstorm cloud tops indicate a strong storm. When the thunderstorm cloud heights start dropping, they become less cold, and the thunderstorms are less powerful. Cloud-top temperatures are important because they tell forecasters how high thunderstorms are, and the higher the thunderstorm, the colder the cloud tops and the more powerful the thunderstorms. 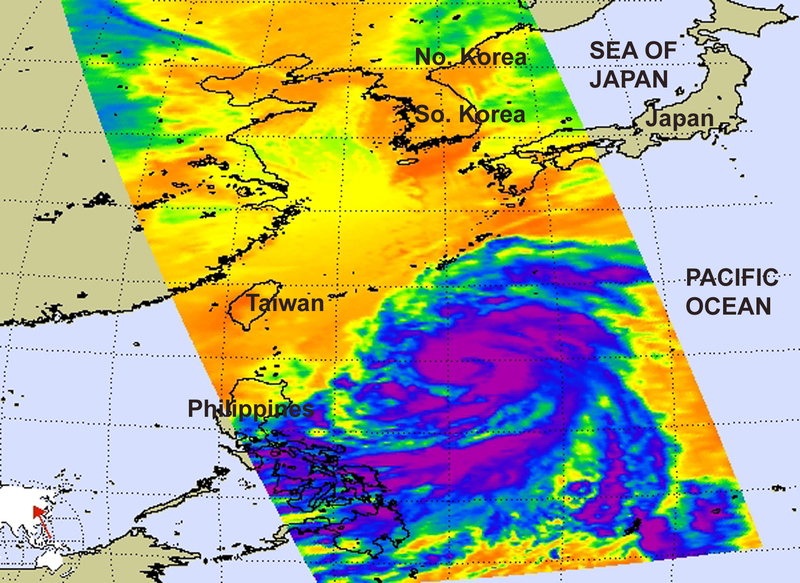 When AIRS captured the infrared image of Giri, the eye of the cyclone was clearly visible and still off-shore. The AIRS image also showed that at that time (0653 UTC) the strongest thunderstorms were still mostly over the Bay of Bengal and had not yet moved over land. Cyclone Giri made landfall in near Hunters Bay, Myanmar on Friday, Oct. 22 with maximum sustained winds near 155 mph, the top end of a Category Four Cyclone on the Saffir-Simpson Scale. Some newspaper reports indicate that at least 27 people were killed and more were missing. A couple of thousand homes were also reported damaged from Giri. Giri has since dissipated inland. Sometimes, it feels like a game show. You know, the ones involving trivia questions that offer you lifelines to either call a knowledgeable friend, or get a vote from the audience, etc? 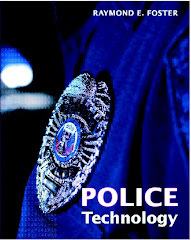 Well, in my daily work here, one my most often used “lifelines” is either emailing or calling the military’s liaison officers, or LNOs, at the National Science Foundation (NSF) back in Washington, DC. When it comes to accessing corporate knowledge of long-standing issues, assessing the viability of something new, or brainstorming solutions, these LNOs are invaluable to the operation on a daily basis. The idea of embedded liaisons is not new. In joint-service operations, there are well-known LNO positions populated by one service or another to provide two-way insight and communication for the Joint Force Commander. An Air Liaison Officer, or ALO, is a good example. Embassies around world may use Defense Attachés as liaisons to integrate or coordinate diplomatic and military activities and interests. When it comes to Defense Support to Civilian Authorities in emergencies or crises, there are rapid response LNOs that can be sent out to a field location to provide direct person-person expertise and coordination between agencies. For better NSF support and coordination, the military has a Department of Defense liaison and an Air National Guard liaison. Because of the Air National Guard’s significant and long-standing role supporting the NSF in scientific pursuits in both Arctic and Antarctic regions, the two LNOs can work interchangeably on many issues. Presently, the Air National Guard liaison to the National Science Foundation is Lieutenant Colonel Mark Doll. Mark is one of our “lifeline” phone and email contacts for a variety of mission-related topics. On a personal level, I count on Mark’s counsel when making decisions involving Antarctic aviation operations, especially involving ice runways and ski-ways. As the former LC-130 chief pilot for the 139th Airlift Squadron, and an expert in practical aviation applications of ski-to-snow interface mechanics, Mark’s advice informs policy. Additionally, he’s earned the trust and respect of his colleagues at NSF. When science support issues concerning operations and logistics percolate up to the NSF management level for decisions, Mark provides appropriate two-way dialog between decision-makers and those charged with executing the decisions. Since the Air National Guard’s role in supporting NSF science extends beyond Antarctica into Arctic Greenland, Mark graciously offered these unpublished photos for inclusion in these Dispatches. Discovery Commander Lindsey: "Ready to Fly"
Learning and the "Social Brain"